VolcanoSummer | All volcanoes, neverending summer. 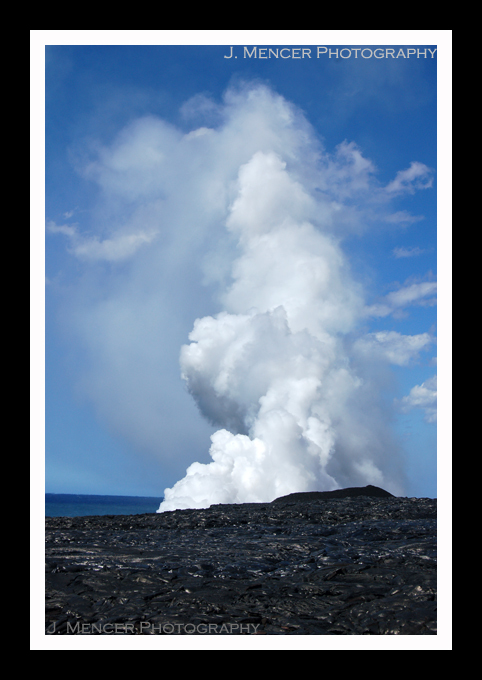 Hello and welcome to the 2nd edition of VolcanoSummer – Hawai`i! This year brings a much shorter visit to the Big Island and a somewhat familiar agenda, with exciting new faces and places added for your viewing pleasure. I arrived in Hilo via Honolulu on Sunday and was promptly met by the excellent Dr. Mark Kurz of the Woods Hole Oceanographic Institute and his nephew, David Kurz. We acquired the soon-to-be Dr. Brent Goehring of the Lamont-Doherty Earth Observatory and made the familiar trek up to Volcano, Hawai`i. This is the town outside of Hawai`i Volcanoes National Park, where our research group has rented two lovely houses for the duration of our expedition. We settled in to discuss the trip and await the arrival of the remaining members of our science party, Dr. Joe Licciardi of the University of New Hampshire and Shasta Marrero and Michelle Hinz of New Mexico Tech. Check out our awesome group! 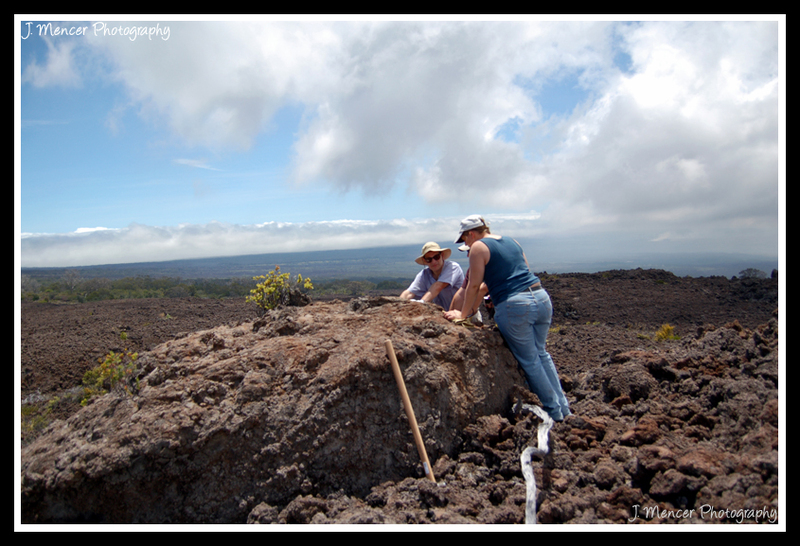 Our group was assembled to perform calibration work for the CRONUS-Earth Project using Mauna Loa lava flows. CRONUS is an international effort by geoscientists to use cosmogenic isotopes in dating many types of geologic features around the world. You may be scratching your head and wondering what the heck a cosmogenic isotope is, so I’ll give you the short version. The sun continually bombards the Earth with cosmic rays, and when some of these rays strike the ground they interact with certain elements contained in the rock. These interactions cause the elements to change into a slightly different version of themselves known as an isotope. You may be familiar with the concept of Carbon-14 dating, where scientists employ analysis of an isotope of carbon in order to date how old something is. CRONUS uses similar concepts but with rocks instead of carbon-based samples. We are here in Hawai`i as part of an effort to determine just how accurate cosmogenic isotope dating methods can be. 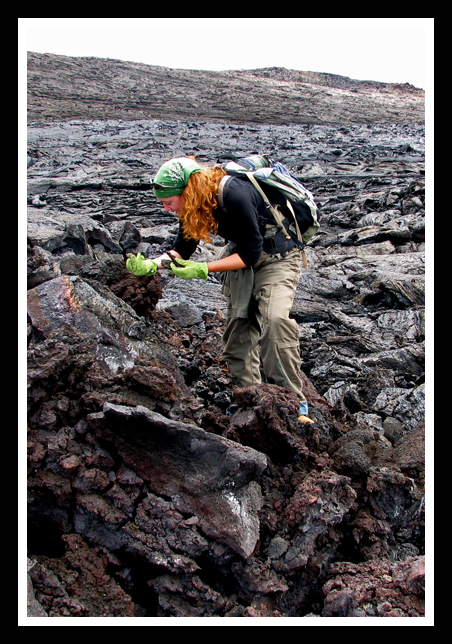 We are sampling lava from flows that we already know the ages of, whether through Carbon-14 dating of burned plant material (charcoal) or from historical accounts. The samples will be sent to laboratories for analysis, and we’ll be able to clearly see how accurate this dating method is. The benefit of cosmogenic isotope dating is that we are not limited as severely as we are with Carbon-14, and much older ages may be obtained. Basically, I’m hanging out with a bunch of geochemists who are into travelling the world and ascertaining the ages of various geologic features such as lava flows and landslides. It’s all in the name of science! Ok, so that’s the detailed stuff. Let’s move on to the part you’ve all been waiting for: pictures! In this photo Mark, Brent, and Shasta are debating the merits of sampling from this particular lava ball. 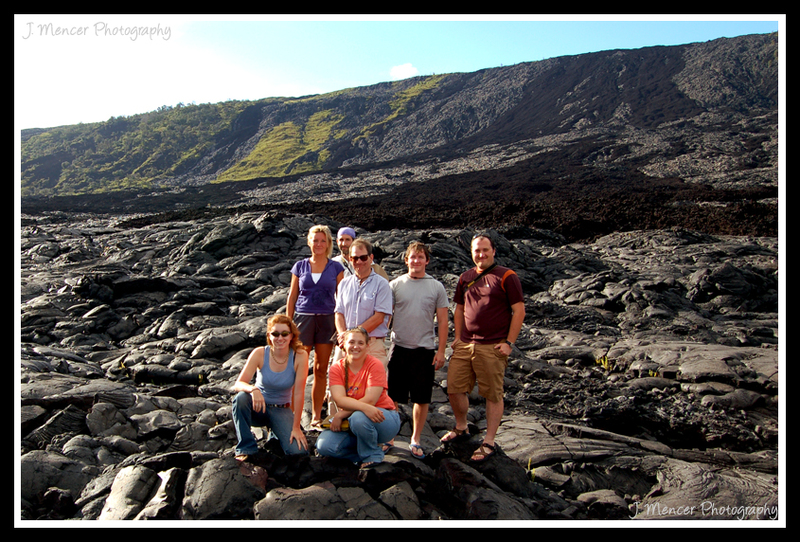 They’re standing on a roughly 900 year old Mauna Loa a`a lava flow. Site selection is key to our undertaking, as anything that could shield the rocks from the cosmic rays will throw off the dating technique. Also, the surface that is selected for sampling has to be the rock’s original surface. Erosion wears rocks down, and that type of material loss would make the rock appear younger than it actually is since the sun’s rays would have bombarded the eroded surface for less time. Scientists also like to use site selection as a means to argue amongst themselves. (No scientists were harmed in the making of that joke, FYI.) In the foreground of the picture you’ll find a 6lb sledgehammer, which can be used for sample collection or warding off greedy competing scientists. 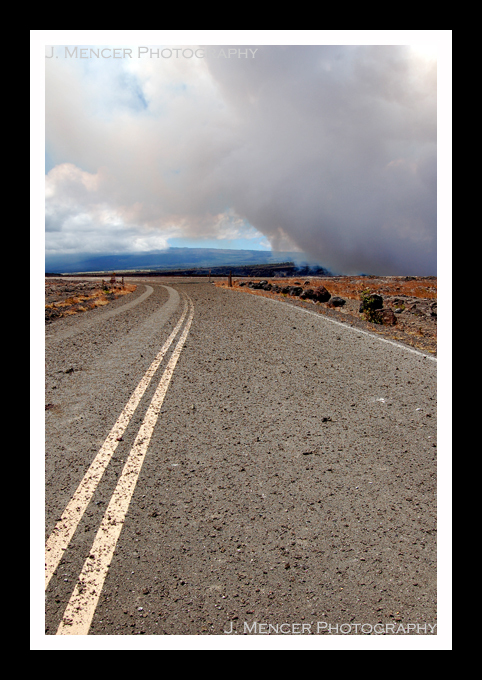 In the back right of the picture you can see Kilauea’s summit plume, which repeat readers may remember from last year. The summit eruption is indeed still going, in case anyone was wondering. Hurricane Felicia never materialized by HVO, but the typical tradewinds were affected enough to cause the plume to blow in the direction opposite its normal route. Seeing the plume is like having a giant (and intensely awesome) welcome mat rolled out in greeting. The vent has increased substantially in size since I left HVO last September, and it now spans approximately 130 meters. To put it in perspective, that’s larger than a football field. Amazing. I’m about to fall asleep while typing, so this’ll conclude tonight’s post. P.S. – It’s great to be back! Well, I have some excellent news that I’ve been keeping under wraps for quite some time since I didn’t want to jinx it. A few weeks ago my boss at HVO mentioned that a scientist friend of his from Woods Hole asked him to join a scientific research cruise to the Loihi Seamount. Since Loihi is definitely something I’d like to research in the future, I promptly freaked out. I demanded to know what his reply was, and he told me that he’d been there, done that. I informed him that he was nuts. To that, he asked if I wanted to go. Cue another freak out. My amazing boss then put in a good word for me with the scientist, and after an interview and much airline and school wrangling…I’m going on a research cruise! That means that instead of leaving here tomorrow to return to California, next Sunday I fly to Oahu. I’ll meet up with the boat and we’ll depart on Monday, 9/22. We’ll return to port on October 12, and I’ll fly back to California the next day. That’s about three weeks at sea! Since marine geology is what really butters my bread, this is one of my strongest dreams come true. Now, here are the details. The cruise is actually going out under the auspices of the FeMO Iron Microbial Observatory at Loihi Volcano. 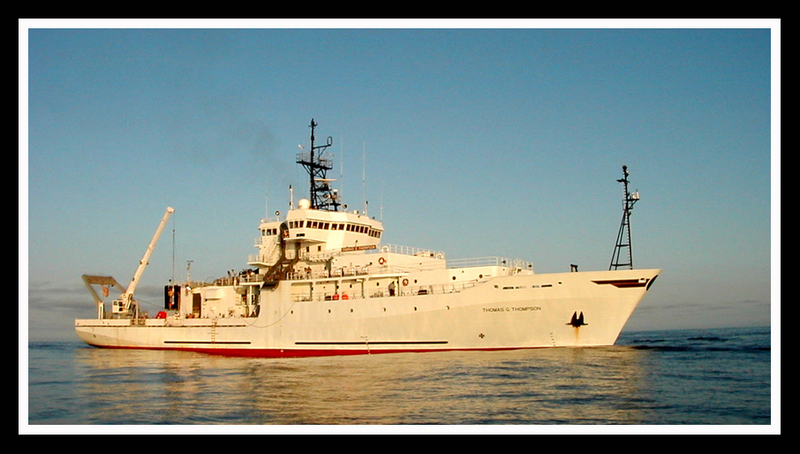 The boat is the R/V Thomas G. Thompson, a NOAA-owned and University of Washington-operated vessel. If you click the ship’s link you can see all of the details, including the berthing setup. I’ll be in berth #35! Excitement. If you read the FeMO link, you know that they primarily study biology. I will most likely help out with that, but I’m there for an experiment in sampling volcanic glasses. My boss on the ship is from WHOI, as I mentioned before. That’s not all of the awesomeness, oh no. It gets better. I assume most of the people who read this blog have watched the Discovery Channel at some point. Many of you may have heard of the ROV Jason. I certainly had, and using ROV and submersibles to do research was another of my life’s goals. You can guess where I’m going with this, can’t you? Jason will be on board, and we’re using him to collect the samples. Absolutely incredible. Words just can’t do justice to how amazing this whole summer has been (and continues to be). I think this is an appropriate time to thank the people who’ve made it all possible. Thank you to my parents, for obvious reasons, and because they’re the best parents anyone could ever have. They gave me chemistry sets and helped me with science fair projects since as early as I can remember. Thank you to my professors at California State University – Los Angeles, and in particular Dr. Kim Bishop. They are magnanimous enough to allow me to make up the coursework I’ll miss while on the cruise, and Dr. Bishop is taking over my teaching duties while I am gone. Thank you to everyone who reads this journal, whether I know you in real life or not. You have made documenting this journey of a lifetime a true pleasure. If you have specific questions you’d like answered, please leave them in the comments of this post. It’s often hard for me to go back and pick the questions out from the comments, so let me know what you’d like answered! Ok, just so this post isn’t all texts n’ links, here’s a picture of the R/V Thompson! From lava to the stars. We made a pretty stunning discovery in Halema`uma`u on Friday. Many months after the explosion that first opened the vent, we finally had visual confirmation of a roiling, active lava lake inside. 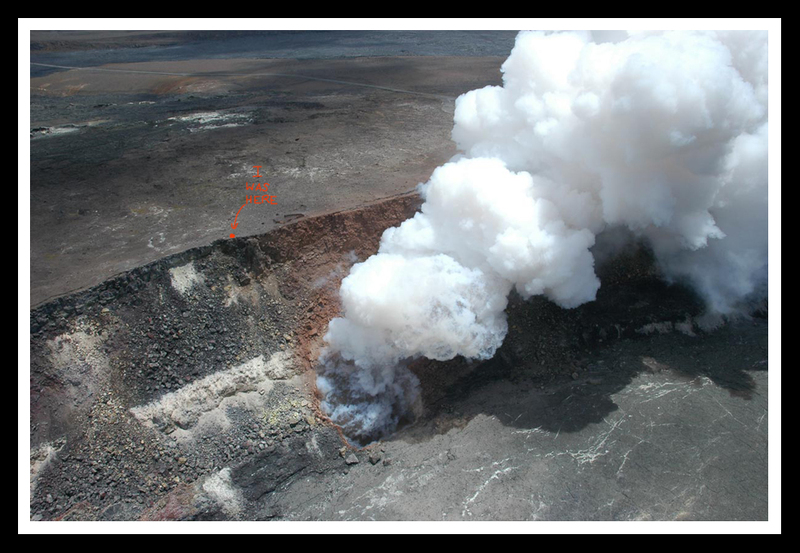 Some of the scientists were over the vent in a helicopter, and they were able to get pictures and video of the lava. The best estimate is that it’s about 100 meters below the top of the vent. 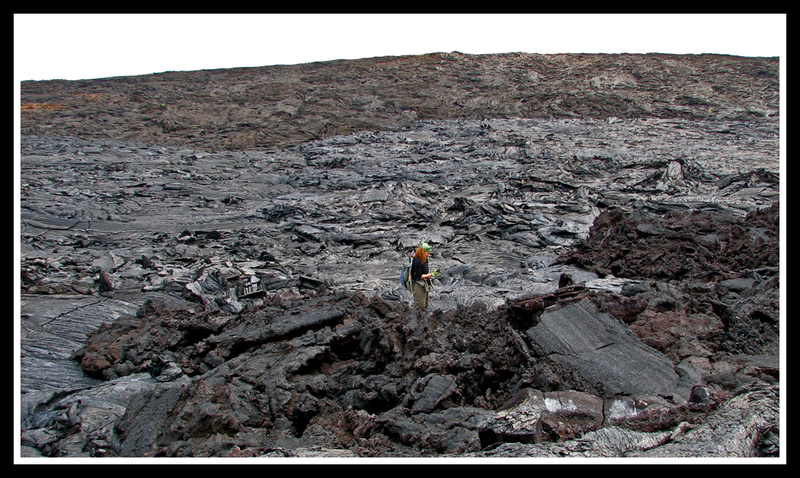 A few hours after the helicopter overflight, I went out with the gas geochemistry team to do Fourier transform infrared spectroscopy, or FTIR since the lava was visible. The round part on top of the tripod is a telescope, and the box on top is the spectrometer. Anyway, since we were on the rim and right over the vent, I think perhaps a picture of the lava’s incandescence is in order. Yep, that’s lava down there. That sort of glow just doesn’t normally happen during daylight hours. It was truly impressive to stand right above a lava lake. The noises were loud, tremendous, and unrelenting. If it wasn’t clanging with rock falls, it was making gas-rushing noises that sounded like jet engines. The earth is alive! I have a special treat for all of you. My colleague Brian White was down on the other side of the vent from where I was, and he recorded video. You can finally hear the noises I keep writing about! Make sure your sound is turned on. It’s possible to see some of the incandescence as well. Saturday brought more impressive sights. I ventured up Mauna Kea with some colleagues to check out the view and do some stargazing. 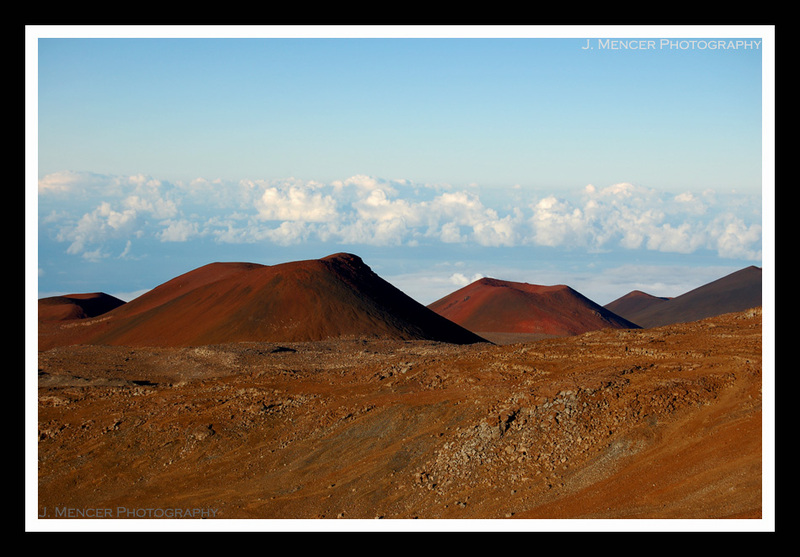 The name Mauna Kea means White Mountain, and that’s because it frequently has snow on its peak during winter. 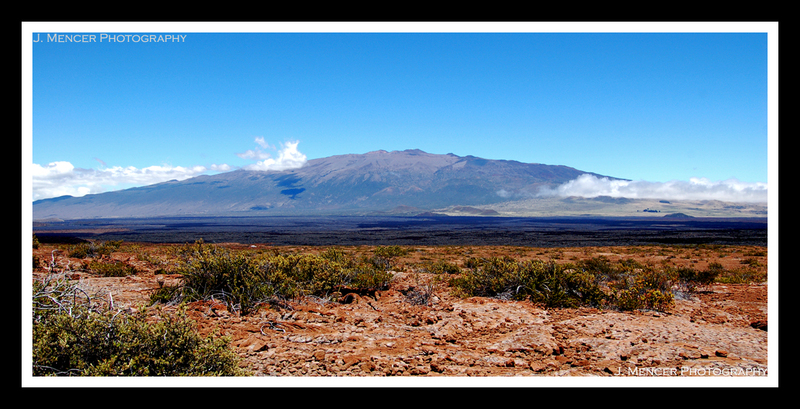 It stands 13,796 feet above the ocean, and is older than Mauna Loa and Kilauea. Mauna Kea is considered dormant, but not extinct. 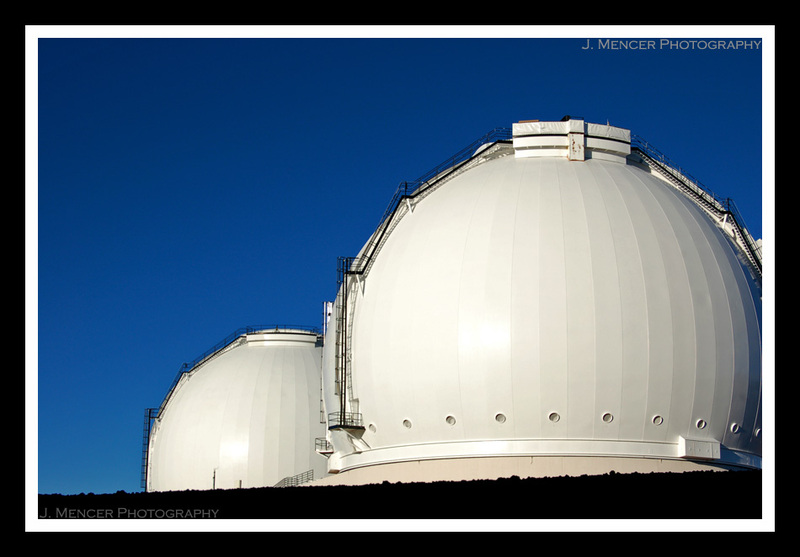 It’s also home to some of the world’s best telescopes and astronomical observatories. Those are the Keck Twins, formally known as the W.M. 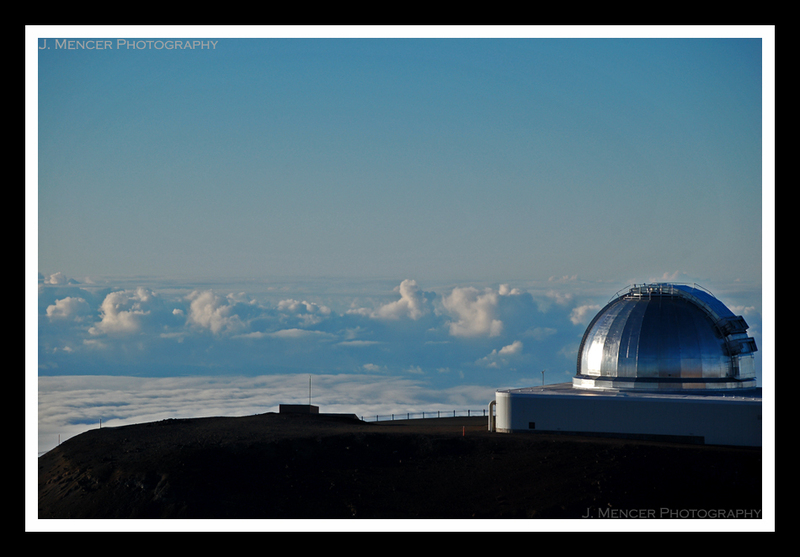 Keck Observatory. 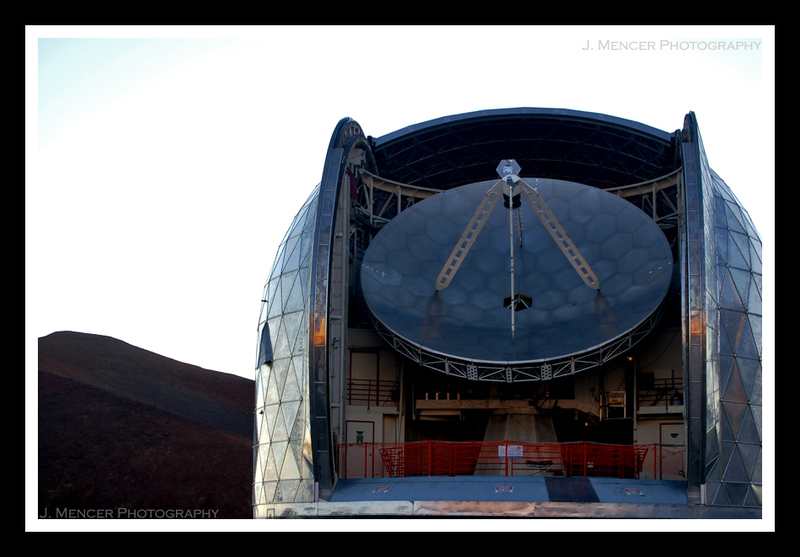 They sit 85 meters apart at Mauna Kea’s summit and they each have a 10 meter primary mirror. Those are cinder cones on the north flank of Mauna Kea. Since the volcano is in its “post-shield building” stage, it is literally pockmarked with cones like these. This is the NASA Infrared Telescope Facility. It was posing nicely for me. It was built to support the Voyager missions. This is the Caltech Submillimeter Observatory with its dome open. I don’t think that one needs much explanation. 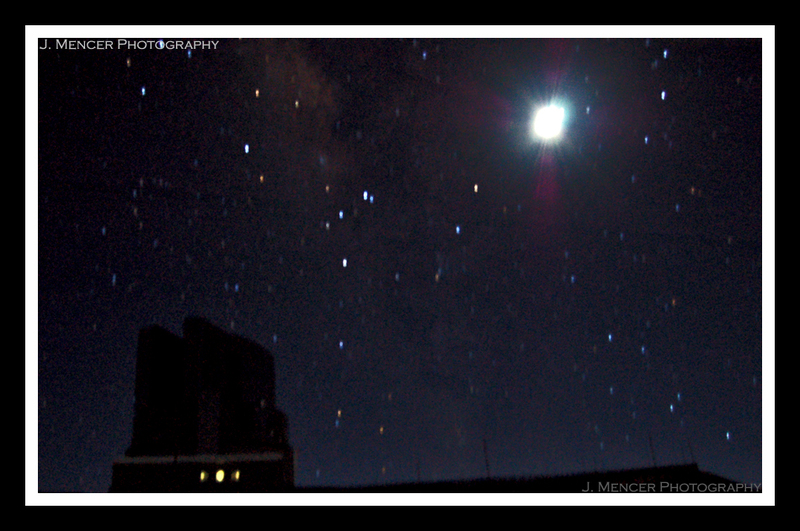 Here we have the moon, some stars, and the Subaru Telescope. Yes, that’s a laser issuing from one of the Keck Twins. 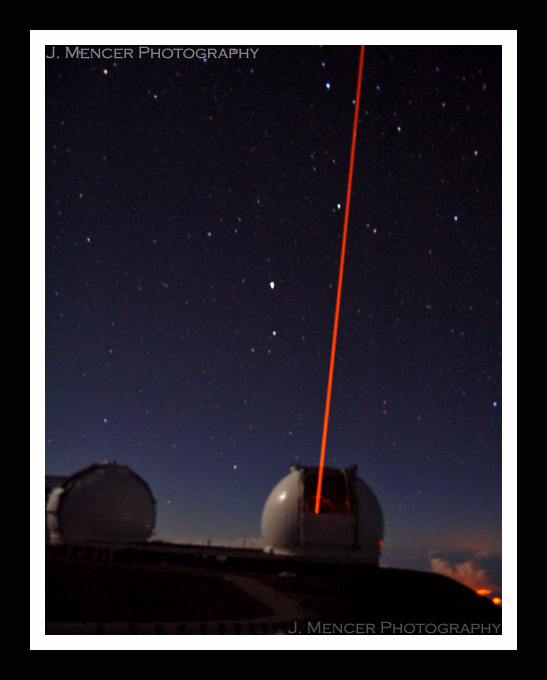 It actually creates an artificial star that astronomers use to establish a relative location in the sky. I’m sure it does some other neat things, too, but I’m not aware of what they are, exactly. ***EDIT*** Check out Andrew Cooper’s comment at the end of this post for the actual use of the artificial star. He knows what he’s talking about! 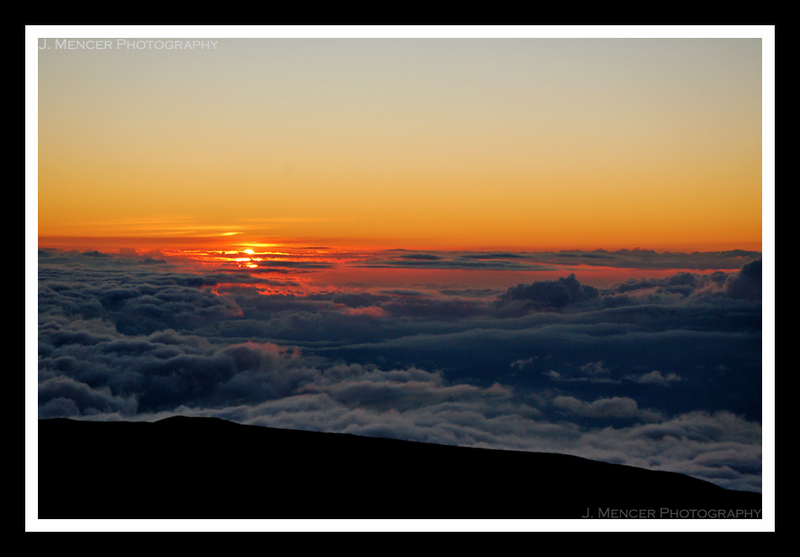 If you’re ever in Hawai`i, sunset on Mauna Kea is definitely in order. Oh yeah…you might want to check out any available lava lakes, too. Volcanic eruptions and fumes, oh my! The night after I helped set up the time-lapse camera to record any collapses of the vent rim, there were two magmatic explosive events. The rim area beneath and to the east of the plume is littered with spatter material. The explosions happened about an hour after I visited the visitor overlook. If only I’d been an hour later! 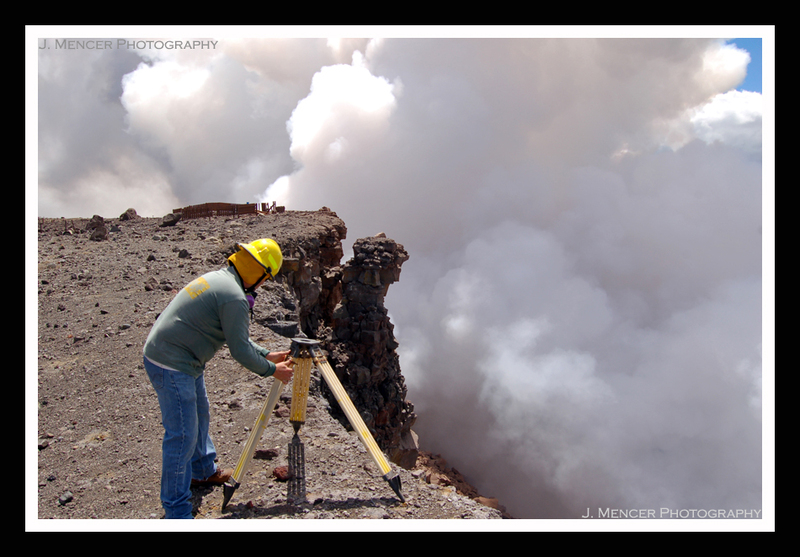 At any rate, I was able to go down into the caldera again yesterday to assist with sampling gases from fumaroles. These are holes in the ground near volcanoes that emit gases and steam. We decided to see the spatter material before venturing in on foot. Let’s just say it’s a good thing that this road is closed to the public. Some of the ejected material was incandescent at the time of eruption, which signifies fairly high temperatures. 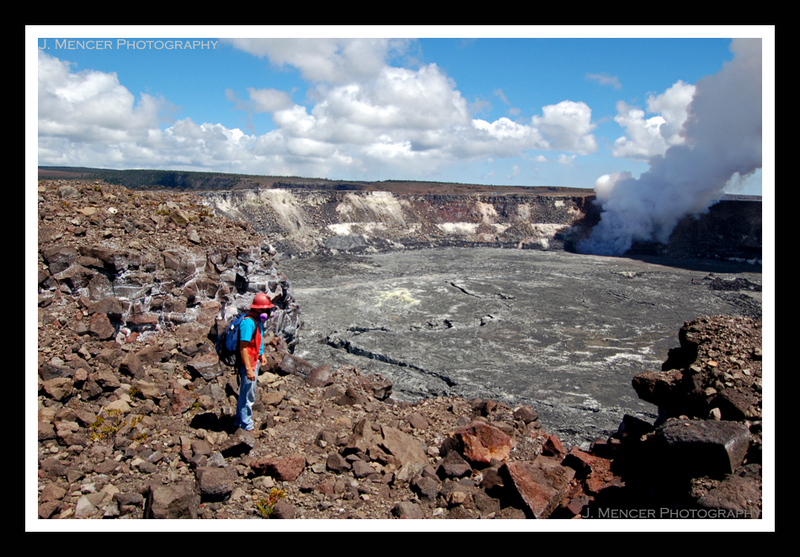 We left that area and journeyed to the less-travelled southern end of Halema`uma`u crater. Here’s a view of the crater wall that you can’t see from the Observatory or Jaggar Museum. 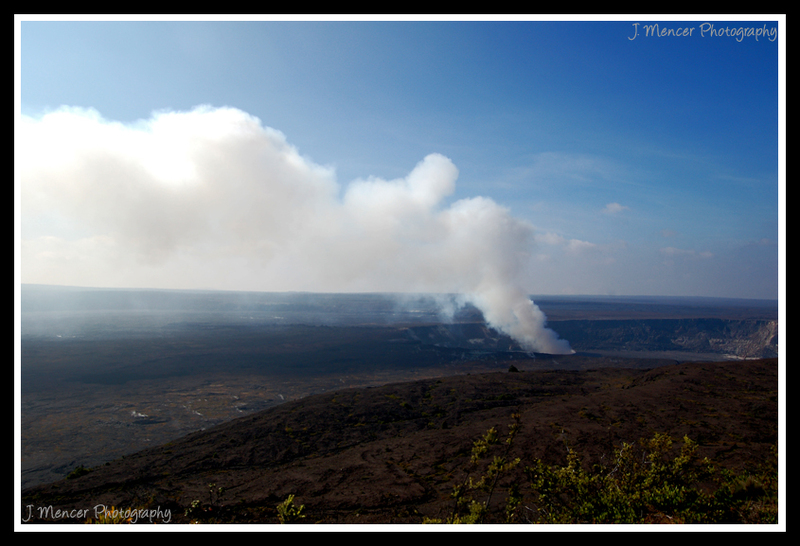 We continued hiking around to the western edge of the crater and stopped for a bit to watch the plume. The vent was making banging noises like it had all day on Tuesday, and after a while it switched to gas rushing sounds. It’s akin to the noise a 747 jet makes as it lands. At one point the plume almost died out, and then it resumed more vigorous puffing and turned brown. Our resident gas geochemist was nice enough to model for me. He’s standing in an area of the crater known as the Postal Rift. When Halema`uma`u was filled entirely with lava back in 1919, visitors could walk right up to the rift and dip their postcards into the lava. The edges would become a nicely singed, unique souvenir of their visit to Kilauea. Try to imagine that whole crater and the rift where the scientist is standing as a lava lake. Pretty amazing. So, I’m sure you’re all curious about what sulfur dioxide does to the areas surrounding it. 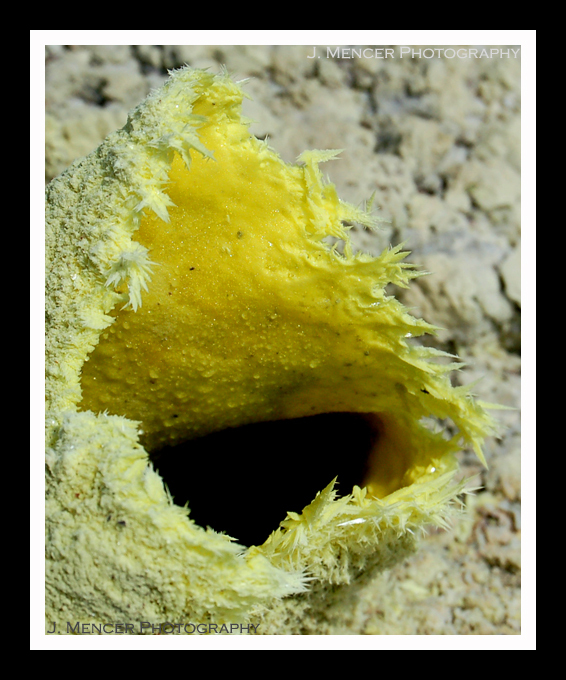 It makes sulfur crystals! 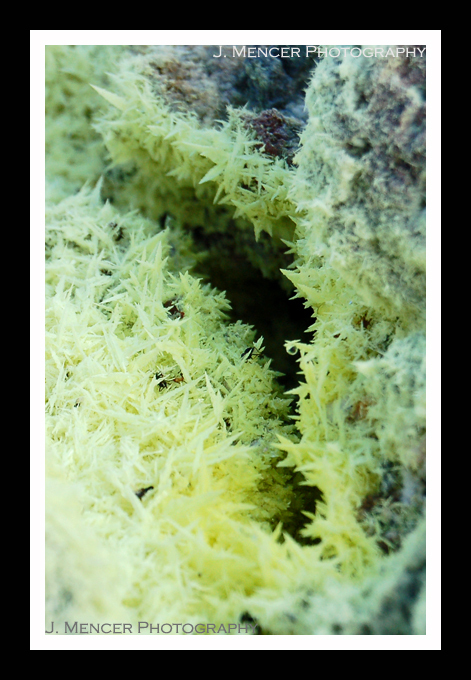 When sulfur-rich gas seeps out of the earth and the area remains relatively undisturbed, it gives sulfur crystals the chance to grow. They’re beautiful. Here’s a fumarole up close and personal. The crystals are about 1/2-3/4 inch at their longest. They also smell like rotten eggs. Hey, perfection is hard! 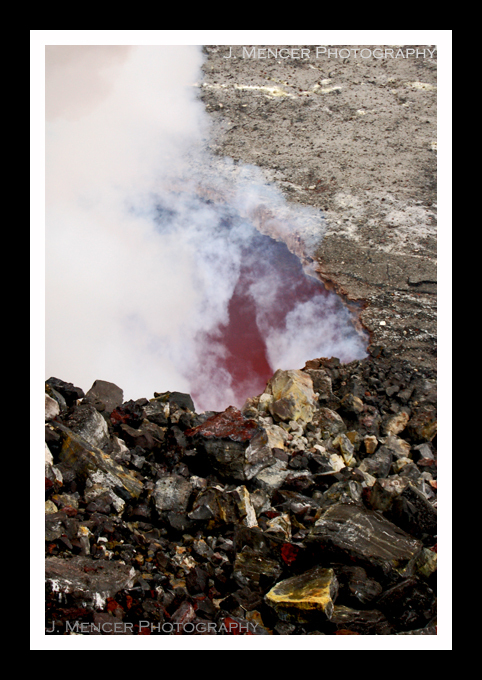 This is what we do with fumaroles…we sample the gas they emit! 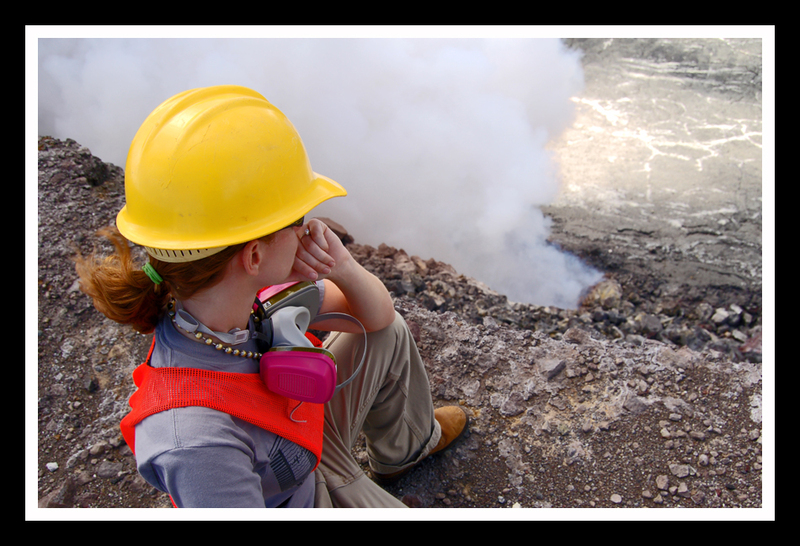 I’m using a technique called evacuated-bottle fumarole gas sampling. 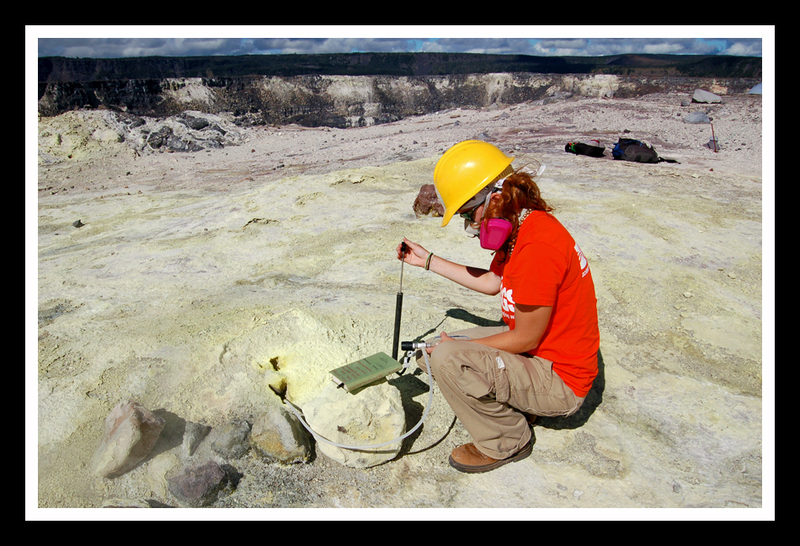 First we measure the temperature of the fumarole using a probe. 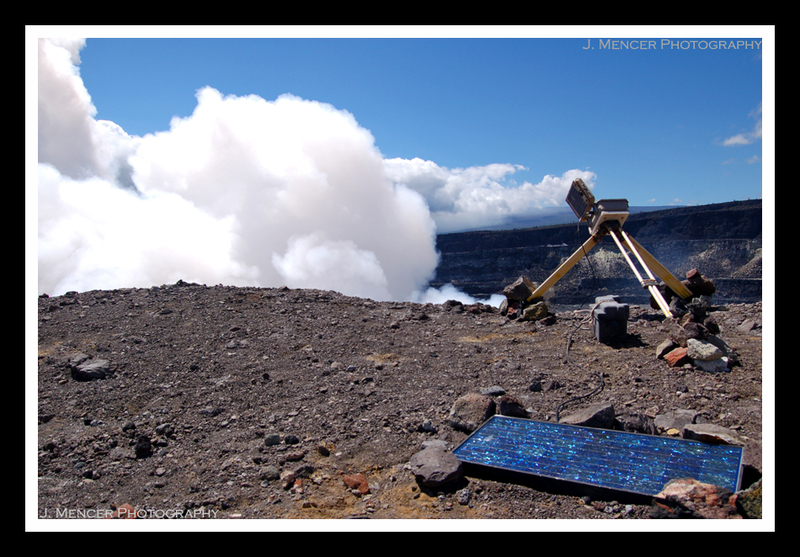 The temperature around the crater is right near the boiling temperature at this altitude = 94.8 degrees Celsius. After that we insert a teflon tube into the fumarole, and connect the tube to a specially-made vacuum-sealed Pyrex bottle. We then pump the gas into the bottle slowly, and make sure that it cools and condenses enough to close the bottle off. Once we get back to the lab we run the samples through a manometer (pressure-reading device) to compare the gas pressure in the bottles to the ambient room pressure. After that we stick it on a gas chromatograph and measure the bottle’s levels of air, water, CO2, and SO2. Fumaroles from different areas have different gas concentrations, and this helps us to understand the magma and gas beneath the crater’s surface. Not a day goes by without me learning something incredibly interesting! Today I did another amazing thing. I suppose if I keep calling everything I do amazing people won’t know how to distinguish daily stuff from special stuff. Either that or you’ll all become geologists! My evil plan will finally come to fruition! Ok, in all seriousness I did something incredible. 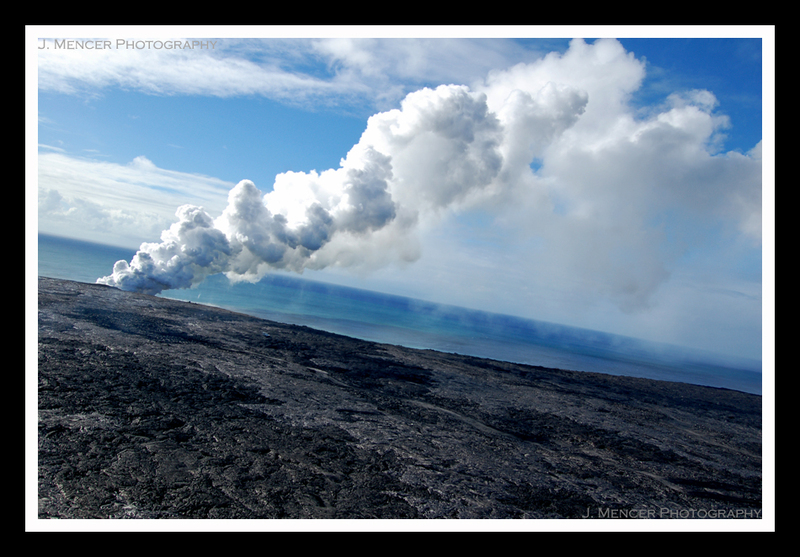 So you know the vent in Halema`uma`u I keep writing about? Today I helped install a time-lapse camera where the red dot in this photo is located. Keep in mind that the dot is about the size of 3 adults standing right next to each other, and make sure you click to see the full view of the image. We also walked all along the rim on either side of that dot to perform maintenance on the ash-catching stations we have set up. I was directly over the vent and it was thrilling. Here you can see the initial setup phase with the monster sulfur dioxide plume in the background. That’s the tripod. Here’s the conversation I had with the geologist in that photo just seconds after I snapped the pic. Not your average conversation at the office, was it? Let’s just say I pondered my time on this mortal coil for a minute whilst gazing into the swirling maw of Hell. In the foreground you can see the solar panel that is responsible for powering the camera. The grey case on the ground is the battery, and the camera is in the open case on the tripod. The camera case lid is shut once we’re done adjusting it. The reason we installed it is that the vent has been growing. The lip and side walls have been collapsing quite a bit lately, so that first picture in this post actually shows the vent even smaller than it is now. The noises issuing from the vent were otherworldly. I now understand perfectly why ancient Greeks and Romans believed that Hephaestus or Vulcan, respectively, was hammering away inside of the volcanoes. It honestly sounds like someone is forging things in the traditional hammer-and-anvil way. The booms are loud, metallic, and frequent. Sometimes it sounds like metallic popcorn, and other times it sounds like the resonating, drawn out intonation of a gong. It’s not always noisy like this. In fact, everyone is remarking on how unusual the noises actually are. I feel privileged to have heard them. For those who are curious, I threw several rocks into the vent. I stopped after it belched out a massive plume that immediately blew in our direction. Making Pele, the Hawaiian volcano goddess, angry while perched on the lip of the vent was not on my To Do List for today. Also of note: Both my photography and my person are present on the official HVO website! 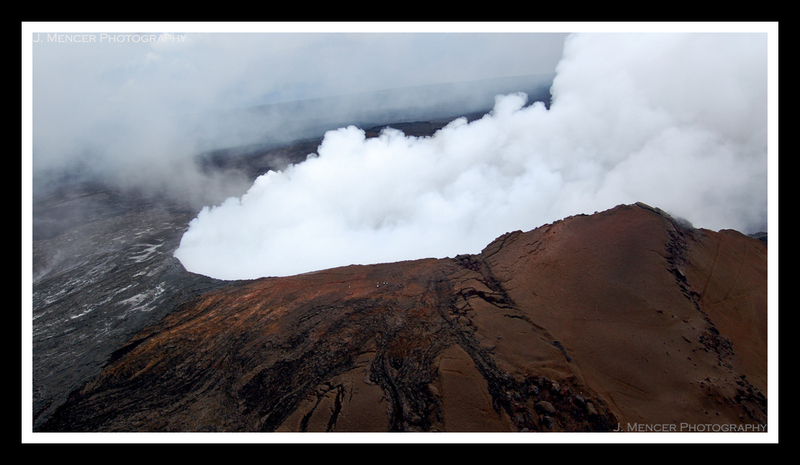 Visit the Kilauea Eruption Update page on HVO’s site to take a look. August 28th is the magic date. Those of you keeping up with the blog will recognize some of the images! The Quicktime video from August 31 is definitely worth a watch, too. 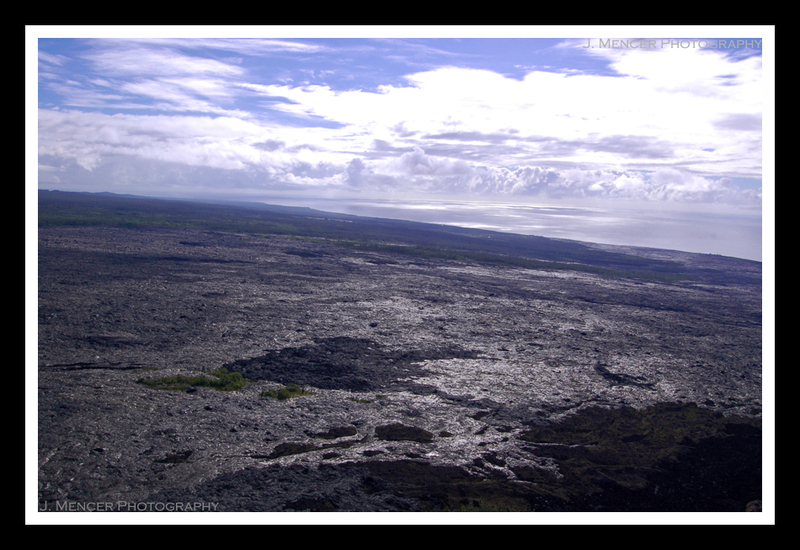 On Thursday I went on a geology overflight to Kupaianaha and Pu`u O`o. This area of Kilauea is in its 24th year of eruption. 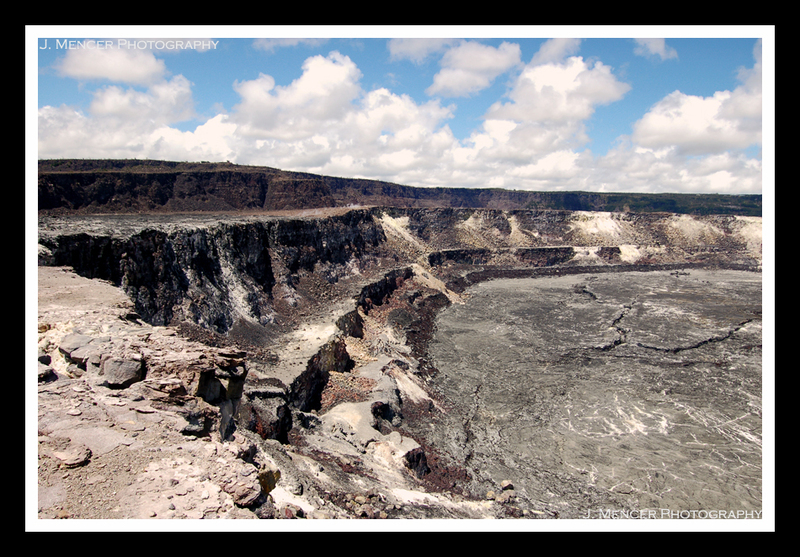 Pu`u O`o is a parasitic cinder cone on the flank of Kilauea, and Kupaianaha is a shield that has formed 3km down from Pu`u` O`o. The first part of the flight consisted of travelling down the path of the flows towards the current ocean entry. This is a view to the northeast. The older flows are darker, and the younger flows are silvery. This is the ocean entry plume shot from above. The lava is pouring into the ocean from a lava tube that is just under the hardened surface flows. The plume is poisonous sulfur dioxide gas (SO2). Here’s a shot of the plume as we were flying away. Helicopters can induce some funky camera angles. The helicopter dropped us off further up the flow field so that we could take some measurements. 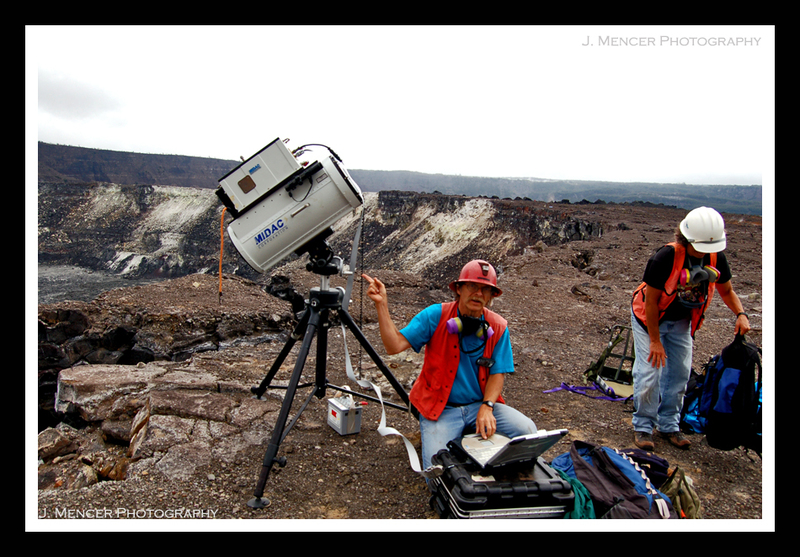 Two of my colleagues are performing Total station measurements with Pu`u O`o in the background. 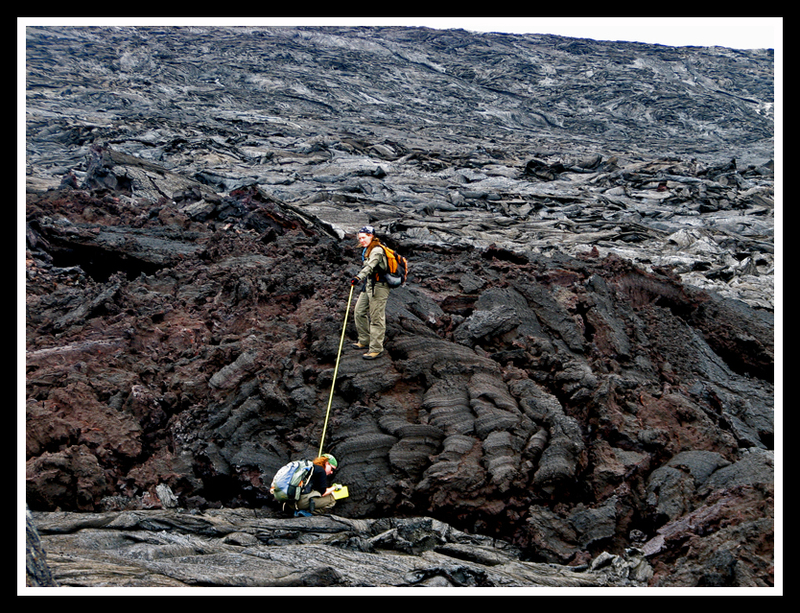 These measurements help us to determine how the ground around the active lava flows and lava tubes is deforming. We can measure elevation change and distances, among other things. 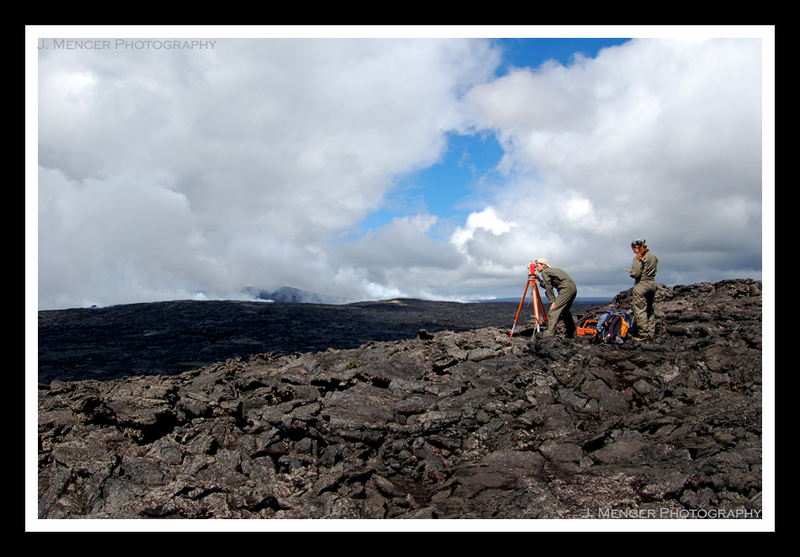 After we finished with the Total station, we hiked towards Pu`u O`o to map a new seep of “toothpaste” lava. 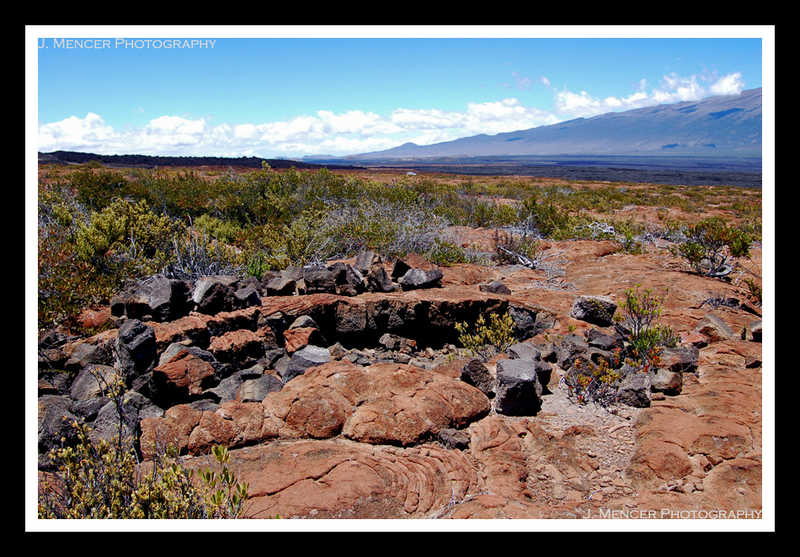 This texture of lava is considered to be a transitional stage between smooth pahoehoe and rough a`a flows. We use GPS tracklogging and walk along the boundary of the seep to create the map. That’s what I’m doing here. The lava seep is from just a few months ago, so the lava itself has an interesting array of colors and textures. There are many small vents of hot SO2 that waft up from beneath where we were standing. I was examining some of the textures and enjoying the warmth of my own volcanic sauna. After we mapped the boundaries of the seep, we measured the thickness of the seep itself. I was holding the base of the tape measure and recording the data. 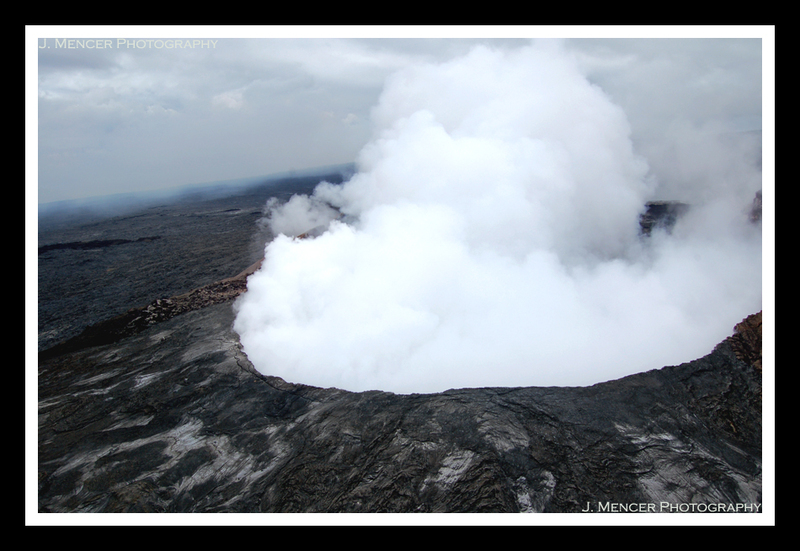 The helicopter met us after a few hours and flew us over Pu`u O`o for a look at the current eruption. For those of you waiting anxiously for the smoking cone, here you go! 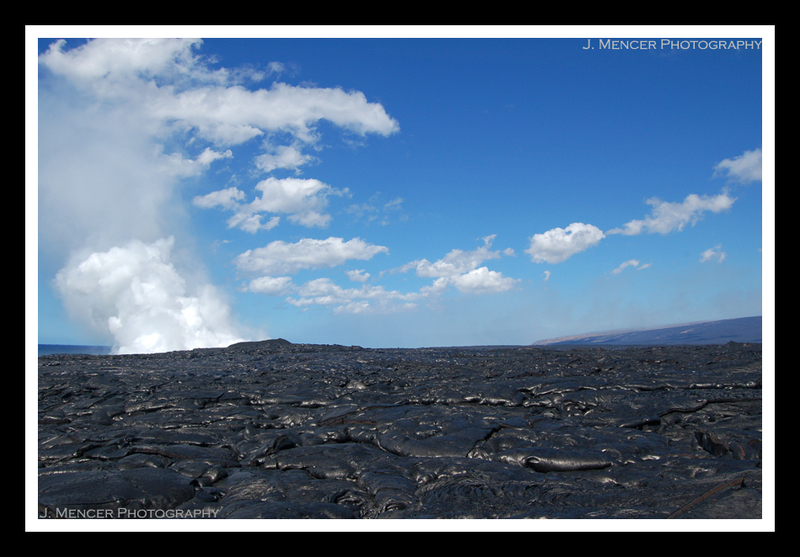 Of course, this doesn’t provide a good perspective of how large Pu`u O`o really is. That’s why I’m including this image as well. Those very small, silver dots near the rim in the foreground? Those are our measurement stations. They’re about the size of an average adult. Yes, Pu`u O`o is large. Flying over it was incredible. I hope everyone is having a wonderfully restful long weekend! It’s work time…field work, that is. It’s high time that I posted about the field work I’ve been doing lately. Before I became sick last week, I was out mapping the newest lava flows at Waikupanaha. Well, it was a gorgeous day and I did manage to snap a few pictures before the hospital called. 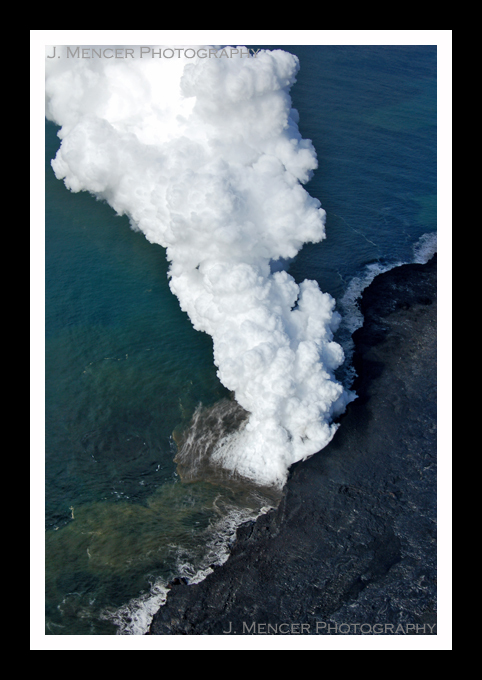 While hiking to where we were to begin our mapping, we heard and saw some lava bubble bursts to the left of the ocean entry plume. Unfortunately, a watched pot never boils and neither does a watched ocean entry. As soon as I pulled my camera out, the bursts stopped. Ah well, at least the ocean entry plume still looked good. This is a view to the south, and you can see the pali (or cliff) at the right of the frame. The lava flows toward the ocean from very far up the pali, sometimes aboveground and mostly underground through lava tubes. The way we map new lava breakouts is by putting handheld GPS units on Tracking mode and then walking along the boundaries of the fresh lava. It’s a good way to map, since you can set the GPS to record your position at intervals of three seconds. The level of accuracy is enough for our purposes. After all, the flow field changes fairly often. Moving on to the field work I did on Friday (it wasn’t too strenuous, don’t worry)! We met up with a cultural resources guy from Pohakuloa Training Area, a massive area between Mauna Loa and Mauna Kea where the Army and Marines practice bombing and combat. The samples we needed to obtain were on the military’s land, so we have to go through the proper channels to collect them. There’s a bit of archaeology in what we were doing there. That is a pit dug by the ancient Hawaiians. No one is sure why they dug these pits, which happen to be about 9,000 feet up the slope of Mauna Loa. We collected samples of the displaced rocks to perform the same Chlorine-36 cosmogenic isotope dating that we did on Mauna Loa’s summit. The reddish lava flow that the pits are situated in is of unknown age, so we’re also going to date that as well. It should give us an idea of how long ago the Hawaiians made the pits. I suppose it can’t hurt to throw in a picture of the other massive volcano on this island. If you can make out a small whitish blob in the left foreground, past the plants…that’s our truck. This might give some sense of how gentle this particular slope of Mauna Loa is. Trust me, they’re not all like that! Tonight is my last night housesitting, so my internet access (and consequently posting) should pick up a bit this week.